Ah man. I locked myself out of my own house today. I've been out running to train for the half in February and taking the key off to stick in my pocket while Gwyn inevitably falls asleep with George. I don't want to end up getting locked out. Unfortunately I put the key back on the wrong set yesterday. Oh, I came home after another skin of my teeth drop off and couldn't get in. I'd been so chuffed up until that point with actually juicing for breakfast rather than later in the day. I tell you now, it is really quite demeaning to have to knock down the neighbours door to get to a loo, then running up the stairs with the words 'I just really need a wee!' it's just a little embarassing. It didn't especially set the day off on the right foot. They don't mention that in all the healthy blogs that cleansing oneself with all the juicy goodness can take you urgently into a place of complete discomfort do they? I am telling you now, juicing can change your life, quite seriously, but you have to be smart about when you load up, (and leave out the celery). That little problem sorted I then got the bin juice all over my shoes because they hadn't been put out ("GWYN!! "), got to the car and little G did exactly what I had been fearing moments before. I put the 'let's try potty training' idea to bed right at that moment. Blah blah blah, it ended up being one of those sorts of days, lots of clunky disorganisation and being pretty annoyed with how everything was going and generally being annoyed with myself. It was not a bad day, just a bit bloody irritating. Onto something less irritating, a bit more marvellous and sort of related to houses because I made a house out of it at the weekend. Makedo. It's a pack of connectors that you can make all sorts of cool stuff with. See here. It's totally re-usable, allows you to be creative, encourages free play and retails at the tenner price mark. What is not to like? Get some. Buy some for Christmas presents. Get your toy shop to stock it. This, by the way, is not a sponsored post, merely a wildly enthusiastic endorsement. Also, I got mentioned here, which pleased me and picked up my day no end. Thankyou! Yesterday I went to the hotly anticipated (well in my world anyway) Knitting and Stitching Show at Alexandra Palace. Well worth the early morning, the delays and the £14 entrance fee it was like the best slice of retail heaven for a crafter. If a little overwhelming. Look at this lovely knitted bunting. Knitters out there will understand just how many hours worth of knitting this represents! If you've never been to this show and it's reasonably easy for you to get to you must make sure to put it in the diary for next year. There are 3 spaces - the main hall which is mainly comprised of retail stalls. There you'll find stands from almost all the crafting publications you can think of, usual sewing suspects like pfaff, brother, janome and singer. Fabric being sold by Ray Stitch, Fabrics Galore, Sunflower fabrics. There are stalls of books with a huge selection of crafting titles. Specialist supplies on sale for knitting, crochet, embroidery, cross stitch, origami and the list goes on. It really is a complete treasure trove. Then the smaller rooms comprise exhibitions, textile artists and guilds/clubs mainly although there are also plenty of other shopping opportunities and Coats craft have an enormous display in one of those rooms. Frequently it felt like you'd been spun around, it was fairly easy to lose your bearings after trawling packed walkways of crafty women with a glazed (albeit content) demeanour. Some stands were really beautifully staged. These bird cages and liberty bias binding were on the Selvedge stand. Where there were also these gorgeous crochet scarves from Sophie Digard. Extraordinary colours and so detailed. Just amazing. Look at these beautiful colours. I bought myself a little pack, my only tangible bounty aside from ideas and inspiration that I bought back from the day alongside an issue of Cloth that Kate is in. Kate has some photos of 'scary' jumpers exhibited alongside this textile designer in her blog post on the day and you can also see a photo of me playing around on a knitting machine. That was one of the main intentions of my day, to learn about how they work and though I was sorely tempted I think I'll benefit from a bit more research. I also made an exciting crochet discovery which I will share with you tomorrow. Crochet lovers - warning - you will be tempted. I had a wonderful day though it was absolutely exhausting, a complete assault on the senses! It was made all the more brilliant in the company of both Florence and Kate. Having never met Florence before I can confirm she is really just as lovely as her blog suggests she might be. We headed to Covent Garden afterward to relax with wine and minimal food which leads me to think we may have peaked with our Saturday night a bit early and after an X Factor session with poorly George I've stayed at home today to recover. Gardening, films and crochet. It sounds wonderfully relaxing but with two snotty, irritating children it was pretty fractious. They were intent on bickering about everything and even now I am at 9pm wiping snot from my son while he hammers away at a keyboard. I don't know where he's got his second wind from after a listless whingey day but he's so hyperactive tonight! George scaled a wall just over a metre tall a few weeks ago. I watched him do it, holding onto the railings above the wall and on top of thinking, 'clever boy,' I thought, 'If he can do that he can climb out his cot..... time for a bed.' I also thought I had a couple of weeks but only a couple of days later Gwyn found him on the floor of his bedroom crying because he'd thrown himself right over. Amazing! He's only 20 months. Having heard all the horror stories from other mums about broken legs and with huge concern for the little guy's safety we've pulled the side of the cot off. But we were repaid for our concern with a little boy who couldn't get over the novelty of getting out of bed and opening and shutting his door. Bedtimes were lasting from 7pm until 10 ish. When he finally did fall asleep he rolled off numerous times. It was getting very frustrating. Too many times in the middle of the night before we went to bed we had to move him from a kneeling pose with his head on the mattress which woke him up and then he was really difficult to get down again. Then, early in the morning he started rolling out of his bed and got a horrible wake up call. Enter an early morning online purchase in a fit of desperation: The magic bumper. Initially, before we got them, I doubted my purchase and in the interim used a rolled up blanket under the sheet. Entirely ineffective. Magic Bumpers are firm foam wedges designed to go under the bedding between the matress pad and a fitted sheet. They are a safer and easier alternative to traditional children's bed guards. These two came to £15 including P&P. Now, he can still get in and out the cot - they're not restrictive whatsoever but he cannot roll out once he's asleep. This has meant much better sleep for me and Gwyn which basically amounts to the best £15 I have spent all month. These on either side of any bed mean a toddler can sleep anywhere and not fall out of bed. My next task: Bunk beds. Time for the progeny to bunk up. All the furore about the film being a bit crap and Anne Hathaway sounding like she's from Pakistan whilst supposedly being from Yorkshire made me finally get round to reading the book. I told my sister on the phone last weekend and she responded with a strangled kind of groaning that made me realise I needed to approach with caution. 'It. is. so. sad,' she said. I can't write much more without an enormous plot spoiler but I really understand why so many of us have taken Dexter and Emma to heart. I resonated with both characters. There are parts of both in us all. From the experience of a parent dying which is a bit raw to read about - to the ridiculous experiences going out can bring. I cried buckets at the description of Dexter freezing a smile on his face when catching sight of his mum looking so ill and then being overly cheery. I cried more than I did at the other thing (if you read it, you know what I'm talking about.) In fact I felt a little out of sorts altogether reading something that on further analysis was abruptly unsatisfying. Not that the book itself was unsatisfying, quite the contrary, just that I wanted it all to end better. Where was the happier happy ever after? Read it. You'll see what I am alluding to. But have the tissues handy. "That was a memorable day to me, for it made great changes in me. But, it is the same with any life. Imagine one selected day struck out of it and think how different its course would have been. Pause, you who read this, and think for a long moment of the long chain of iron or gold, of thorns or flowers, that would never have bound you, but for the formation of the first link on that memorable day." What a fantastic quote. Which is why I'm reading this next. Not least because it was one of dad's favourite books, so one of the tenuous links to something I can experience that he did. Plus although I've enjoyed a straight run of topselling fiction - I'm looking forward to a bit of Dicken's, it's been too long. On Thursday we had a family day out to Lewes. It's only about 10 minutes from us here in Brighton and as city newbies we haven't checked out all the surroundings yet. After a morning of fun at Monkey Bizness (that's soft play with around 150 screaming, red faced, frenzied children that all seemed to be foaming at the mouth in excitement) we headed into town and had a look around. After a bit of lunch and a wander into one or two shops it became apparent that the children were way to tired to do anything else. On the way back to the car though I managed to pop into The Patchwork Dog and Basket, a shop I'd spotted on my way to lunch. 'Wow, I feel like I've walked into someone's house,' said Gwyn when we got inside. It really is a quilters paradise. The room is literally heaving with fabric and the haberdashery is so well stocked you are bound to find what you're looking for. Based in the needlemakers there are a number of other shops in the building along with a gorgeous cafe. I'd thoroughly recommend a visit to all those sewers that find themselves in Sussex. As I have got so much crochet on the go at the moment I exercised huge restraint and held back from buying anthing more exciting than a length of what I would call cotton ribbon for bunting and a bit of silver ribbon. Would make a decidedly boring photo and that's if I could find it. My home has descended into chaos and a small paper bag of ribbon has been swallowed whole. I'll definitely be making a visit shortly though. There's a lot of crocheting going on here at the moment but I'm desperate to get sewing again soon. A couple of weeks ago Gwyn's mum recommended the book above. I haven't finished a novel in ages so this suggestion was pretty timely. I absolutely love reading but I don't do nearly as much of it as I want to. So I resolved to read a chapter every evening. Straight after both the children are in bed I read at least one chapter and this was a delicious book to get my teeth into. A definite page turner, set in the circus, tells the story of Jacob Jankowski and how he came to be a part of circus life. There's injustice, passion, and an elephant. I loved how old age was handled so sensitively. I really felt for the older Jacob. I thoroughly, thoroughly recommend it. I don't want to give any spoilers but suffice to say I'm sold on Sara Gruen as a writer and have ordered 'Ape House' from the library. I cannot wait to see this at the cinema. I really do hope to keep up the habit of picking up a book as the first part of my downtime in the evenings. Next up... The Cookbook Collector by Allegra Goodman - described as the Sense and Sensibility of the Internet age. Will be posting on this in a couple of weeks time. Got any good recommendations for me? I'm all ears. I joined the library yesterday. It was an initially promising experience. I love libraries, I love books, it's indoors, the baby can crawl around and not cut his hands like he did on the beach the other day. I can read stories to the toddler and keep her entertained for the morning. Or, I could lose her. Which I did. I clipped George into the buggy - looked up and I was missing somebody who has been within reach of me for the last two years. I think she was 'lost' for about 3 minutes during which I became increasingly more and more internally frantic and strangely more and more externally mute. It was traumatic and I'm not joking - she'd wandered into the adult library looking for me. I can't expect a two year old to stay in amongst all the other children but I would have kind of expected it. I don't know what made her venture out there. Needless to say I feel like an awful awful mother. On the plus side I got this book out which I read about in a sewing magazine a few months ago. I sort of flicked through it this morning and I haven't been able to put it down, it's only so far been marginally about sewing and I find it all a bit disjointed but it's not put me off. It's more like a series of columns - the author's a journalist for the Times so that fits. What I think I'm finding so captivating is the fact its about a normal person grappling with what to believe, how we should live, struggling to understand issues with the environment and politics. There are anecdotes and stories I've found entertaining which have kept me turning the pages. Chapter 13 (the 'depressing' chapter) about peak oil was plain scary and gave me the fear. I'm terrified of a descent into a lawless society because of depleting oil reserves. 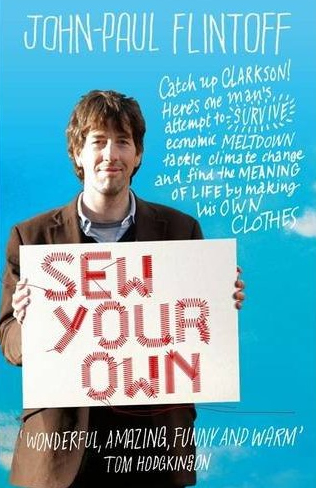 I'm not sure when he gets round to actually sewing. In fact the title and the sales pitch written on the cover is a bit misleading as far as I can tell at the point I'm at. I'll let you know if it starts making any sense. It was pretty interesting reading about Sian Berry and her campaign to 'ticket' 4X4 drivers with fake parking tickets. I've been reading up on her on her website and her involvement with the boiler scrappage scheme with help of twitter is impressive. Makes me feel very lazy about my environment. I used to be a bit more of a conscientious citizen but I seem to have got caught up in the demands of life and my family. It's made me think I ought to be a bit more aware. Making Magazine arrived on my doorstep courtesy of my lovely mother in law last week. She thought it would be right up my street, which it is. I've subsequently seen it as Sainsbury's recommended read in their magazine section. It's the first issue and it's filled with promise... 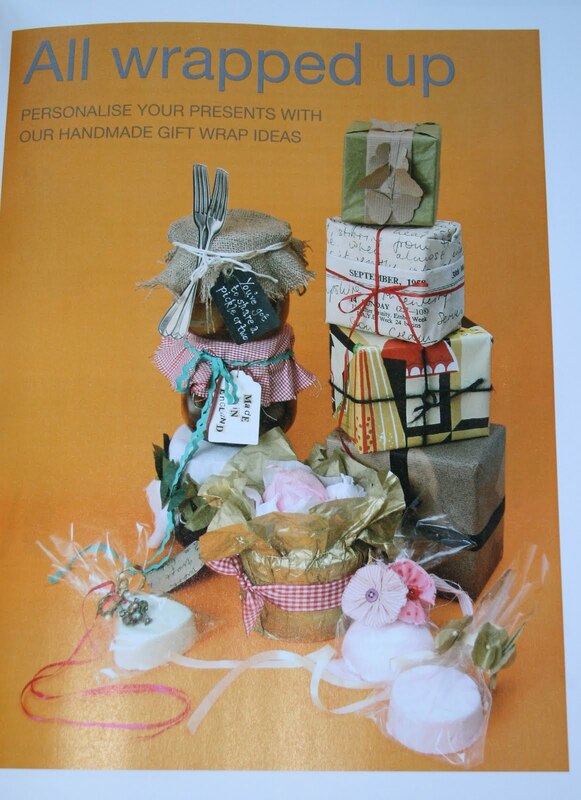 Although being a bit of a mixed bag: upholstery, preserving, accessorising clothes, baking and other makes including a welly stand, making your own buttons and bird cakes I'm not sure I'd buy it every issue unless I'd had a quick flick through and seen there was anything I'd actually desire to make. This Nov/Dec issue has some good ideas. I think I'll try the bird cakes (for feeding the birds in the garden) and perhaps the bath bomb idea. But there are a few dodgy makes I'm not sure about which let it down for me. 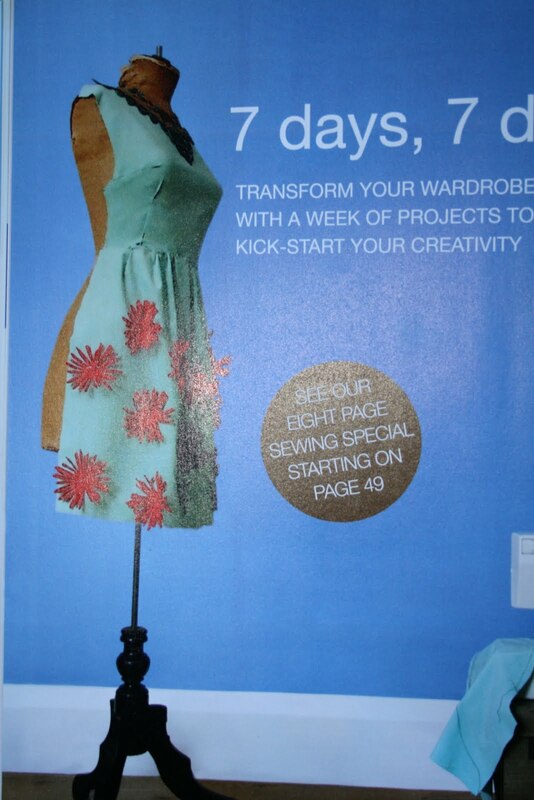 The 7 days 7 dresses article has a tutorial for sewing (rather large in this case) silk flowers to a dress and it's not really my thing. And the reason I think it's a bit of a dodgy one is it's not really anyone I knows thing. I did see the mad lady dancing at the bus stop on Mare Street who'd sewn very fake flowers all over her outfit a while back but generally very 3d objects attached to your clothing isn't a good look young or old in my circle. What do you think? And the only other thing that let's it down for me again is the styling and layout. I think they let the magazine's content down. I'm not saying my layout on this blog is all that hot. It's something I'm actually a bit disappointed with and trying to sort out, but my eye for what I want to see is telling me that there is a bit of room for improvement. I loved the front cover (despite the dress!) but I wasn't mad about the way the preserving article was styled and laid out or the reviews for the sewing machines being on a different page to the pictures of the sewing machines. Still, on the whole I will probably buy this magazine intermittently and I enjoyed a great deal of it. For me it's just a strange one because some of the makes are very introductory and some require a fair bit of equipment so I don't really know who they are catering for.